Nephrite Jade is often used in dream work, to help with lucid dreaming, and with remembering dreams. The "stone of fidelity", Jade is wonderful for working with the Heart Chakra, balancing male and female energies, and helping with dysfunctional relationships. Many use Nephrite Jade as a protective stone that transmutes negative energies into positive. 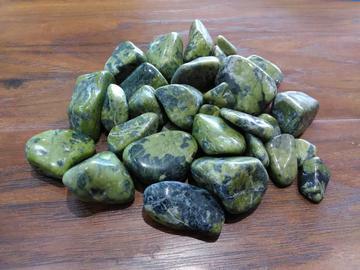 Nephrite Jade can instill a sense of calm and well-being, and can help to increase one's enjoyment of life. Nephrite Jade promotes confidence and calms the nervous system. Stone Sizes Range From - 1/2" - 1 3/4"